These are the characters you get to chose from, each one with their own unique story. I was blown away by the Walking Dead back when I played it in January, as I’m sure many of you have heard from many publications, its a landmark game for story telling, and certainly has a uniqueness to it that’s hard to find elsewhere. 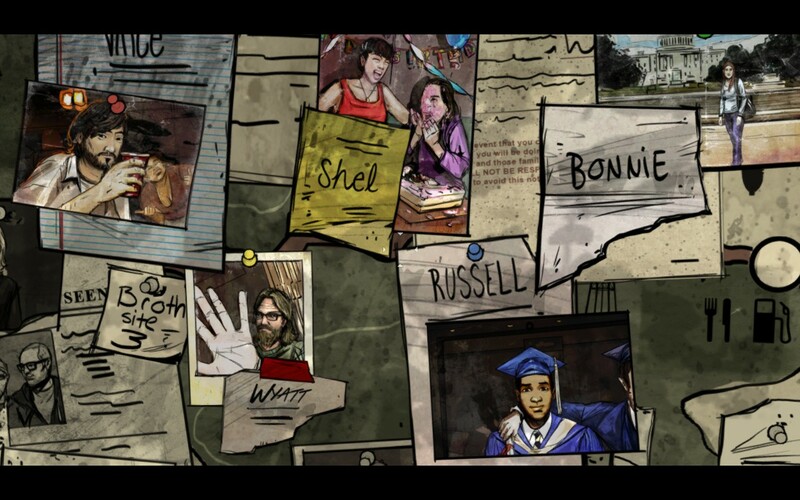 400 days is a piece of DLC to go on top of the walking dead, and is seen as a separate chapter on the chapter select screen. Each story is about 20 minutes in length, with a Epilogue that follows after completing each characters story. So for £3.99, its a nifty price for an adequate amount of content. 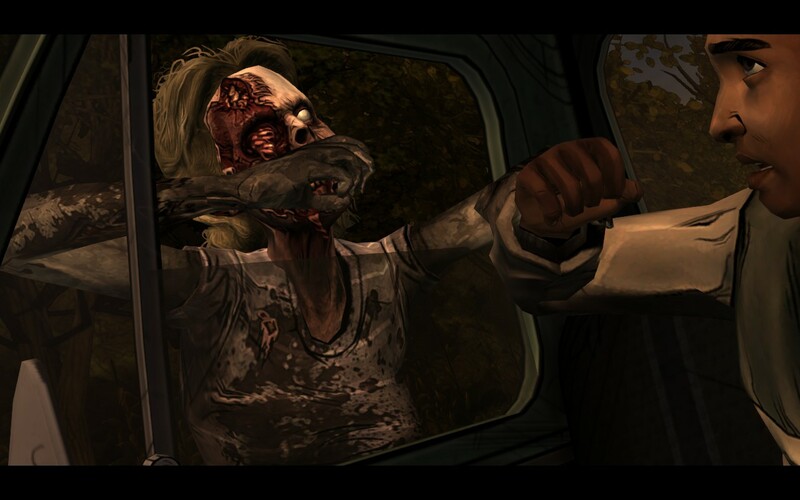 As with the previous Walking Dead chapters, zombies are still a part of the story, but it’s the characters and relationships which really makes the game come to life. Each story feels like a fully realised game in itself, with characters feeling extremely rich and deep. 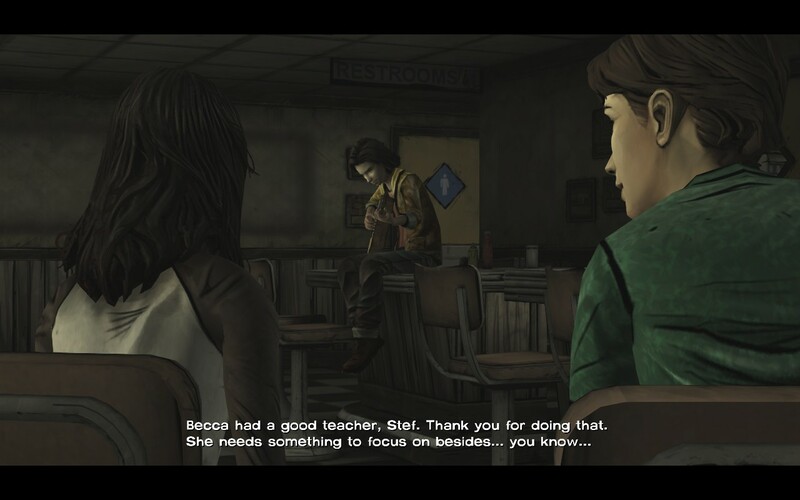 It makes you wonder what other game studios are doing with their writing staff, or whether Telltale Games have stole all the good writers of our time. 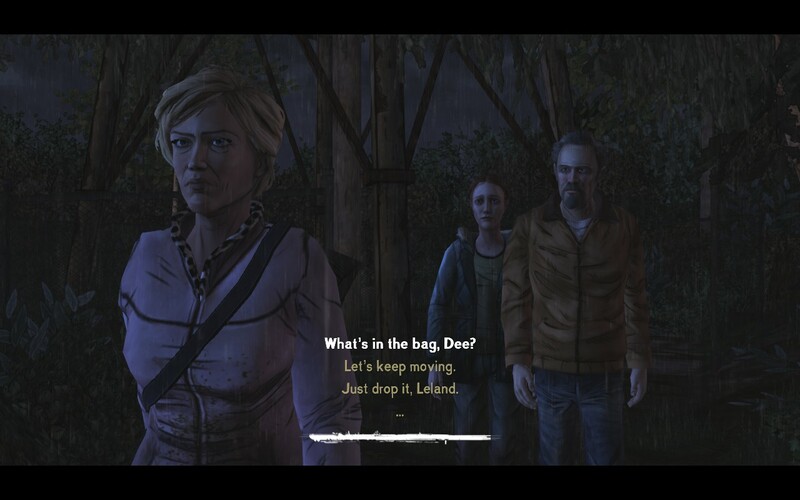 When you select a character from the billboard, you play as that character, and undergo the traumatic experience they did on a certain day within the 400 days after the initial outbreak. Having the characters’ stories broken up into different days really helps to tell completely different stories, and helps to make you face different scenarios as time goes on. For example, a whose story begins a few weeks after the outbreak may be fine for food, but may have relationship or bandit problems, where as a character at 300 days may have food problems, therefore tensions would break out about rations. It makes for some very different scenarios, allowing characters to flourish under these intense situations. Multiple choice is back in this DLC, with decisions seeming to have a greater impact on the story than in the original game. Graphics and gameplay haven’t changed, with the game turning to multiple choice and conversation options to tell a story rather than action sequences. That isn’t to say that the original game had a lot of action pieces, but this DLC certainly has a lot less, making it a lot more laid back than previous chapters. Decisions you make seem to have a lot more impact than previous chapters, now this may be because you aren’t as attached to the characters (how attached can you become in 20 minutes? ), but things are definitely a lot more drastic than before. Dialogue is fantastically written, as it was in the original, there’s just not as much to do this time round. So in conclusion, The Walking Dead: 400 Days gives you more of what you want, and less of what you didn’t want from the original 5 chapters. Its shortness does stop you from getting as emotionally involved as the original game, but each story has enough depth to make sure you’re satisfied.